Increased Cycle Life, Higher Cycle Rates, and Lower Cost per Cycle. 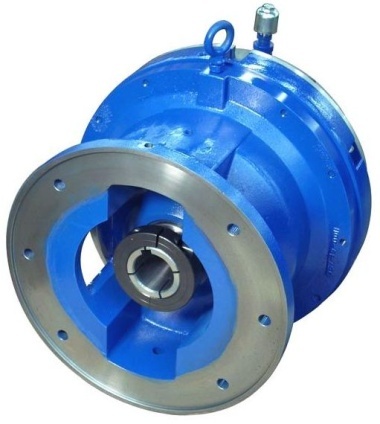 Force Control clutches and brakes with Oil Shear Technology are of the wet or hydroviscous type which transmit torque between the drive plates and friction surfaces. Specially formulated transmission fluid is used for cooling and provides a hydroviscous fluid film between the friction disc and the drive plate during the dynamic phase of engagement. 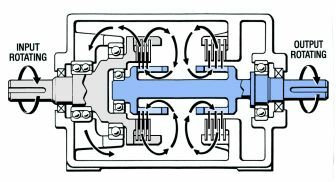 The transmission fluid in shear transmits torque between the two components increasing as the clamping pressure increases until mechanical lock up occurs. By cooling the friction surfaces and reducing the mechanical wear, a significant increase of thermal capacity and total cycle life is possible. Many competitive clutches and brakes depend on friction between dry surfaces surrounded by air to transmit torque. During engagement of dry surfaces, high heat caused by slipping is difficult to dissipate quickly causing wear, glazing, and friction material degradation. This in turn causes positioning inaccuracy, limited service life, and possible safety issues. Oil Shear Technology only works if the fluid is in the right place at the right time. the Fluid Where it’s Needed - When it’s Needed. When the clutch input shaft rotates, fluid resting inside the barrel of the clutch is drawn out through radially extended passages by the centrifugal force of the rotating drive plates. The natural level of the fluid supply inside the unit housing replenishes the fluid drawn out of the hub barrel. Recirculation is established. The fluid flowing across the friction surfaces carries the heat of engagement to the housing for dissipation and returned to the sump. The brake hub, like the clutch hub on the rotating output shaft pumps fluid through the radially extended passages to the center of the brake stack. Centrifugal force of the rotating hub and friction discs causes cooled fluid from the sump to flow through the brake stack to the friction surfaces. Fluid flow is established in preparation for brake engagement. These Products All Have Oil Shear Technology! Why Do Force Control Clutches and Brakes Require so Little Maintenance? The Secret is Oil Shear Technology. Oil Shear Technology was developed by Force Control Industries for our clutch and brake products in the late 60’s. Competitive dry friction clutches and brakes require constant disc replacement, and other maintenance depending on the design. Spring set brakes tend to need constant adjustment due to friction disc wear. Wear and heat cause the friction material to wear away as well as glaze and degrade. Because heat is a major contributor to early failure cooling is a major concern. Attempting to allow air through the brake for cooling means dust, dirt, moisture and chemicals can get into the unit causing corrosion, sticking linkages, friction material and other components to faster wear. There are wet brakes on the market that are just that. The units contain fluid. The fluid helps to remove some of the heat in a totally enclosed unit. However due to the high unit pressures between the friction disc and drive plates involved there is no real oil shear activity occurring. So we still have high wear rates, and limited heat transfer from the working part of the friction disc to the housing. Oil Shear Technology as incorporated in Force Control clutches and brakes solves three of the major problems regarding clutches and brake – friction material wear, actuating parts and components wear and heat transfer. By dealing with these three important items clutch and brake life can be extended 5 to 50 years with only occasional minor maintenance. 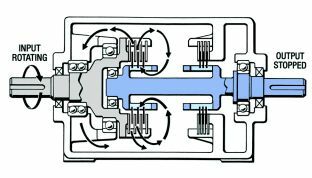 How Does Oil Shear Technology Work in Force Control Products? A major component of Oil Shear Technology is providing a film of transmission film between the friction material and related steel disc. 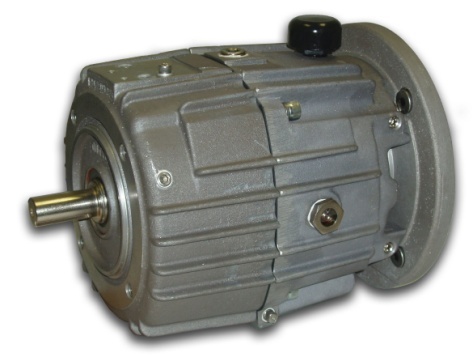 In a clutch the drive plate is rotating with the input power source (typically a motor), and the friction disc is spline connected to the output or indexing shaft. 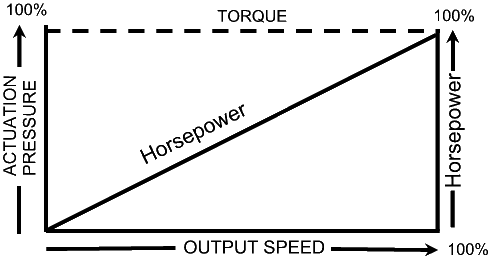 Engagement causes the output shaft to be accelerated to the input speed. In a brake the friction discs are rotating with the output shaft and the drive plates are locked to the housing. When engaged the output shaft will be decelerated to stop. Engagement consists of squeezing together the friction disc and drive plate. This can be accomplished through a piston actuated by pneumatic or hydraulic pressure, or springs through a pressure plate. The higher the engagement pressure the more torque is transmitted. 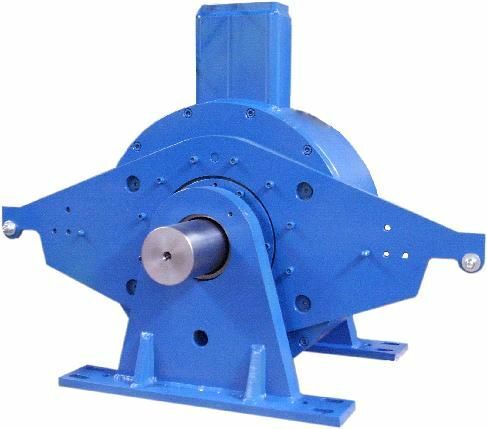 The Oil Shear principle consists of maintaining a fluid film between the friction disc and drive plate. As they are pressed together at differential speeds the fluid film is put in shear transmitting torque between the two parts. During this dynamic portion of the acceleration or deceleration the fluid film separates the two parts virtually eliminating mechanical wear. As they come together the film is broken and the parts mechanical lock together (static torque). This however happens at a low differential speed causing minimal wear. How Oil Shear Technology Deals With Heat. Clutches and brakes turn rotary motion energy into heat energy. Therefore it is important how the heat is removed. Two different scenarios’ create the heat in the clutch or brake. While accelerating with a clutch approximately half of the heat goes to rotary motion and the balance to heat in the clutch. 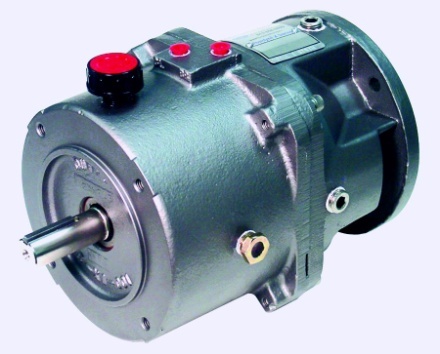 In the case of a brake all of the rotary motion is converted to heat in the brake. In Oil Shear Technology much of the heat is generated in the transmission fluid during acceleration and deceleration and the rest in the friction disc and drive plates. Flowing the proper amount of fluid through the clutch and brake heat can be removed from the friction area. Where does the heat go? In a standard cycling clutch, clutch brake, or brake often the internal fluid circulation system designed by Force Control is enough for most applications. Options such as fan cooling or water cooling can be used to remove excessive amounts of heat, and extremely high cycle rates, or continuous slip applications transmission fluid can be forced through the stack to an external forced lube cooling system. The result of Oil Shear Technology is significantly reduced wear of the friction material, and due to the lubricating properties of the transmission fluid extended life of the bearings, splines, and drive pins. Removing the heat greatly reduces degradation of the friction material causing glazing, and fade. Because with Oil Shear Technology Force Control spring set brake do not require adjustment because with the minimal wear the torque maintains nearly full torque through the life of the brake. This means no torque fade when that extra heavy load is on the crane, or missed position on that incexing machine. Because the unit holds transmission fluid it must have a totally enclosed sealed housing. This not only keeps dust dirt, moisture, and chemicals out of the clutch or brake which cause corrosion, rust, sticking parts, friction material wear, but also contains any friction material dust from escaping the unit. What makes Force Control Products the lowest cost to operate in the industry? What is Oil Shear Technology? Oil Shear Technology involves the use and control of transmission fluid in a friction device consisting of multiple friction discs and drive plates. This friction stack can be used as a brake or a clutch. A proprietary re-circulation system built into the hub enables fluid flow through the stack, over the contact surfaces, and out to the housing or an external cooling system. In this way heat built up within the friction stack is carried out of the stack to be cooled, reducing the wear and degradation of the friction material. As the stack is compressed, either by pressure (air or hydraulics) or springs, a boundary film of transmission fluid is put into a shear condition between the friction surface and drive plates. Through this shearing phenomenon of the specifically designed fluid, torque is transmitted between the two surfaces accelerating or decelerating the other part. Two things are happening. 1. Much of the work is done through the shearing of the fluid itself; therefore the heat is generated within the fluid, not the friction stack. 2. The fluid film separates the friction disc from the drive plates reducing mechanical wear of the friction material. Several other benefits are provided by Oil Shear Technology. As the transmission fluid used is also a lubricant, it lubricates the bearings, splines and driver pins reducing wear on those parts for extremely long life. And the housing itself offers even more benefit. It is a highly efficient heat exchanger pulling heat from the fluid, and dissipating to the outside. 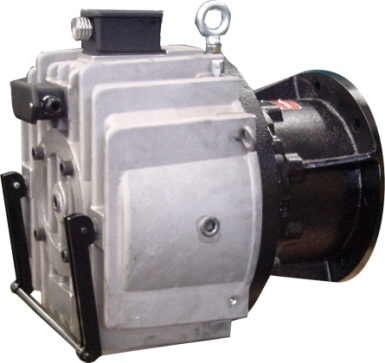 Because the transmission fluid must be contained within the brake, the housing is totally enclosed and sealed eliminating outside contaminants such as dirt, dust, chips, food, moisture, or chemicals. It also seals contaminates inside, eliminating friction material dust common with many dry friction products. No adjustment – ever! – Particularly spring set units (often motor brakes) typically have to be adjusted because wear on the friction stack causes the springs to extend reducing the pressure on the stack. At a point the torque is reduced to dangerous levels, and possibly the actuation system may not be able to release the brake. Oil Shear Technology so greatly reduces the wear on the friction stack that adjustment is never needed. Extra long springs adds to maintaining consistent torque over years of service. Low maintenance – a quick inspection of fluid level and color is all that is needed. An annual fluid change is recommended for best results. No adjustment, linkage, disc or coil replacement is regularly needed. A simple annual fluid change is recommended for the best performance, and longest service life. Extremely long life – designed for 40,000,000 cycle life compared to 5,000,000 to 10,000,000 of ordinary dry friction competitors. The dry friction units may experience much quicker wear if in severe dirty, dusty, or wet environments. The Force Control units with Oil Shear Technology operate in totally enclosed sealed housings protecting operating components from environmental contamination. Smooth engagement – as the friction stack is engaged the friction disc and drive plate coming together squeeze the fluid film which begins transmitting torque smoothly and quietly. Although torque is transmitted quickly, the acceleration is smoother. Quiet operation – eliminates the clap and clatter of dry friction clutches or brakes and the loud noise associated with a hard friction disc and drive place coming together. 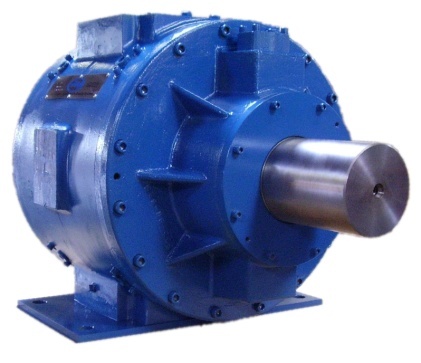 In a true hydroviscous drive, torque is transmitted through the shearing of an oil film. Fig. 1 shows how this shearing action takes place and illustrates the factors involved. The upper plate moves with velocity V. The lower plate is stationary. A very thin layer of fluid adheres to the upper plate. This layer of fluid moves with velocity V. We will assume that the fluid flows in parallel layers or laminas, and that no secondary irregular fluid motion is superimposed on the main flow. This kind of flow is called laminar. F is the force required to maintain the flow to slide the fluid layers relative to each other by overcoming internal fluid resistance. 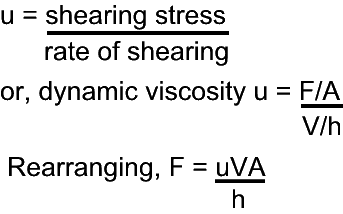 If A is the area of the plate in contact with the fluid, then the shear stress is F/A. Fig.1 shows the linear velocity distribution in the fluid. The rate of shearing the fluid is V/h. During each unit of time there is an angular change equal to V/h. Viscosity of the fluid is defined as dynamic viscosity or u. You will note that force (or, in rotary motion, torque) is directly proportional to viscosity, relative velocity of the surfaces and the area in contact. It is inversely proportional to the thickness of the oil film. There is no metal-to-metal contact until relative velocity approaches zero, at which time energy levels of the input and output parts are virtually equal. Therefore, there is very little energy transfer, thus no wear. Now examine the variables involved and notice the effect of each on F, which in the case of the hydroviscous drive equals torque output. F is proportional to u (dynamic viscosity coefficient). 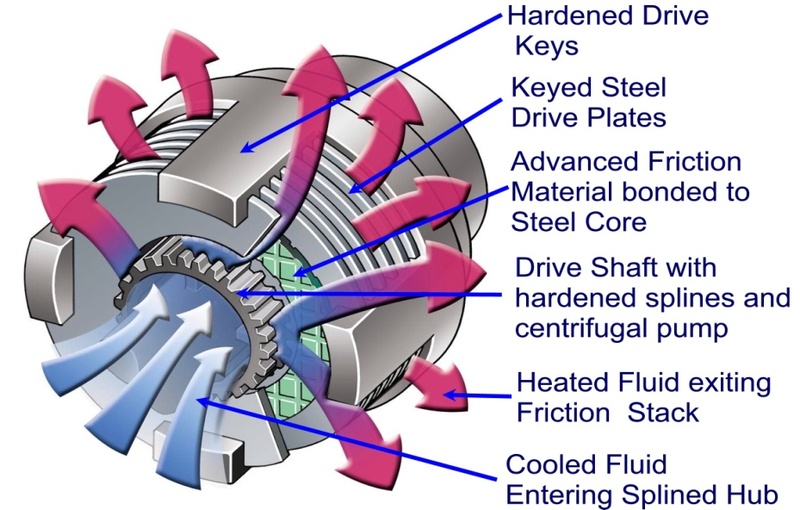 The range of operation of a hydroviscous drive covers three distinct areas; boundary, mixed film, and full film lubrication. Boundary lubrication exists with low relative velocities, and full film lubrication is present with high relative or slip velocities, with mixed film lubrication present in between. Boundary lubrication occurs very near lockup, where apparent dynamic coefficient of friction approaches the static coefficient of friction. For the materials and oils used, the static and dynamic or sliding coefficient of friction have values between 0.06 and 0.13. The effective coefficient of dynamic viscosity (or apparent coefficient of friction) is considerably below these figures under mixed and full film lubrication conditions. 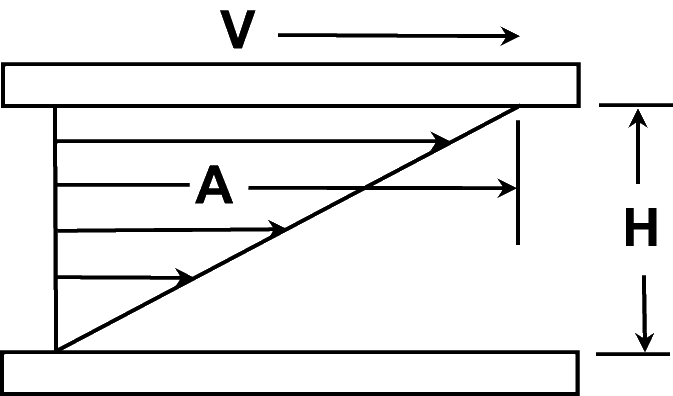 As h increases, or there exists an increase in separation of mating surfaces, V (relative velocity or slip PRM) also increases to maintain constancy of torque. This is due to the hydrodynamic wedge effect. This inherent stability also exists in the reverse direction. This relationship may be interesting from an academic standpoint, but how do we put this principle to constructive use? We said that torque transmitted by an oil shear film varies inversely with film thickness. Direct control of film thickness, in multiple disc assemblies is impractical. Film thickness can be controlled, however, by controlling clamping pressure on the multiple disc pack. The clamping pressure or force against the disc stack is a function of the area behind the piston (thrust mechanism) and the actuating pressure. This leads us to the practical relationship of torque transmitting capacity being directly proportional to actuating pressure. It can readily be seen that the hydroviscous relationship is only valid when an oil film is present between the working surfaces. Since relative velocity goes to zero at the same time h or separation height goes to zero, the value of F or the torque producing force would seemingly go to infinity or zero, neither of which is practical. For operation at or very near lockup, the condition exists which is described by the following relationship. This relationship shows that for a given device design, meaning that N (number of working surfaces), r (mean effective radius) and u, or effective coefficient of friction (type oil and friction materials) have been established, output torque is again a function of force on the disc pack. 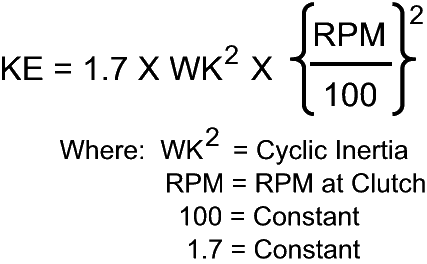 From this relationship it follows that relative velocity or slip speed is not a factor, and that torque is virtually constant for a given actuation pressure on a given multiple disc device over the entire operating speed range. Graphically, it develops a typical curve as seen below. Why do we use a multiple disc pack instead of two large surfaces working against each other? The most obvious reason is that the package size for a particular torque rating is of a smaller diameter with multiple discs. A more subtle, but more important reason in accel-decel devices is that inertia increases as the 4th power of the diameter. 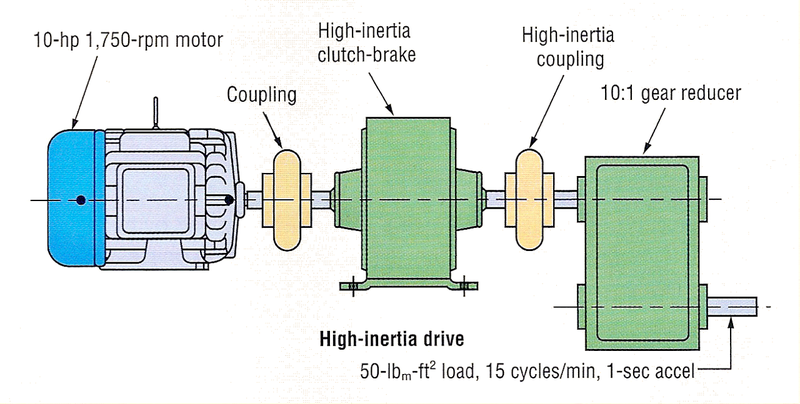 Since energy per engagement of a clutch or brake is a function of the inertia that must be brought up to speed or to a stop, any excess internal inertia just adds to the starting or stopping load and the subsequent heat level. One of the inherent problems with multiple disc devices is uneven loading between working surfaces during an engagement. This is due to spline and lug friction resisting the axial movement of each plate and disc when clamping pressure is applied. As more and more clamping pressure is used to move the disc pack on the spline and lugs, less pressure is being transmitted to the working surfaces farthest away from the piston. Oil film pressures in a hydroviscous drive between mating surfaces under constant slip conditions and full load sharing is quickly achieved. In drives over 100 H.P. at 1750 RPM spring separations between plates are used to aid load sharing. In all clutch/brake or clutch devices, however, uneven loading, if not compensated, leads to uneven wear of the working surfaces. Curve A is a wear profile for a dry friction type or dipping type clutch. Curve B indicates the wear profile of a multiple disc device with an equal amount of oil applied to each working surface. Curve C indicates an optimum even wear condition which can be obtained by virtually flooding oil through the working surfaces closest to the external actuation source or piston. This is the method used in the Posidyne Drive, which is explained in detail in the manufacturer’s catalog. The above wear/oil flow relationship is important to note is the unique feature that allows hydroviscous drives to exhibit their characteristic long lives. The curve is based on a constant torque being applied over a full acceleration period. It should be noted that as much energy is transformed into heat as is transferred to the load. In a properly designed hydroviscous drive, this heat is generated in the oil film rather than the actual working surfaces. The constantly replenished film carries the heat of engagement to the unit sump, where it may be removed by any of several methods. The total kinetic energy for any one engagement is not a function of acceleration time. 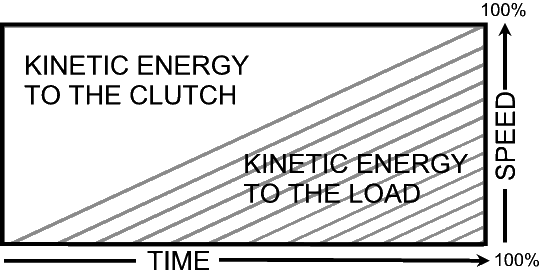 However, the rate at which kinetic energy is put into the clutch is a function of total acceleration time. If the rate at which energy is put into the clutch exceeds the heat absorption capacity of the oil flow through the clutch, a residual heat buildup in the working surfaces will result. This condition can lead to degradation or wear of these working surfaces. The clutch pack consists of a series of alternating drive plates and friction discs. The drive plates have a keyed outside diameter that engages the drive keys on the input shaft. 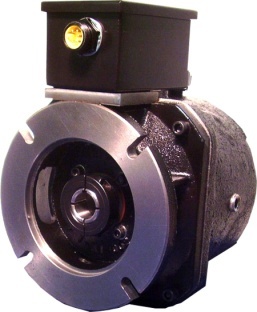 The drive plates rotate continuously with the input shaft. The friction discs have a splined inside diameter that engages the splines on the clutch hub of the output shaft. The friction discs rotate and stop with the output shaft. Different types of friction materials are used on the face of the friction discs to provide the connecting or working surface of the clutch pack. These friction surfaces must deal with the engagement heat of the clutch. The brake pack also consists of alternating drive plates and friction discs. In the brake pack, the drive plates are mechanically grounded to the unit housing and are non-rotating. The friction discs engage the splined brake hub on the output shaft. These friction surfaces must deal with the engagement heat of the brake. The output shaft provides start and stop control of motion and torque from the prime mover as the clutch and brake are alternately engaged. 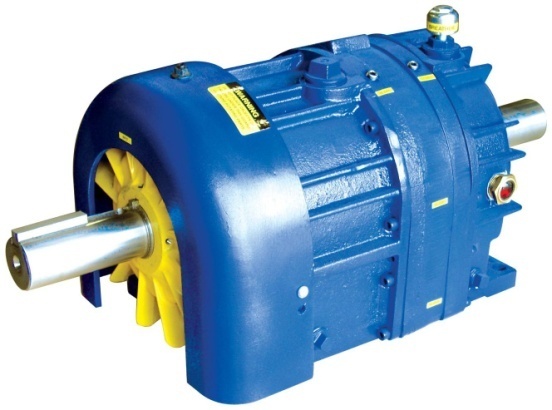 The output shaft is typically connected to the load by a method similar to those used to connect the input shaft to the prime mover. 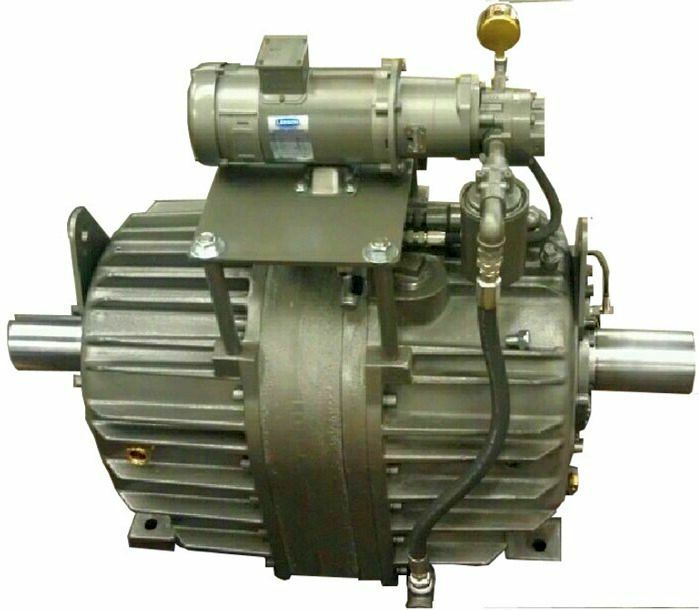 The actuator of a pneumatic, or air clutch brake differs greatly in construction and function from the coil and stator typically used to actuate electric clutch/brakes. Compressed air is used to control the axial movement of a piston which applies a clamping force to either the clutch or brake pack. The amount of torque transmitted by the clutch or brake is controlled by the air pressure applied to the piston. The amount of air pressure also controls the acceleration and/or deceleration rate of the drive. Several varieties of spring set brake/air set clutch devices have evolved. The use of a basic fluid power principle, PRESSURE x AREA = FORCE, enables air actuated clutches and brakes to develop high amounts of force in a small space. Electrically actuated clutches and brakes are rarely found in applications requiring over 240 ft. lbs. of torque capacity. 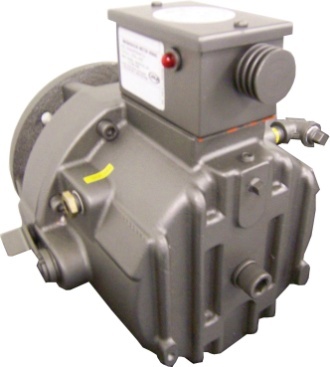 A much larger range of air actuated clutches and brakes are available with standard torque ratings of up to 50,000 ft. lbs. and beyond. Generally speaking, a larger variety of air actuated clutch and brake units have been developed for industry, which offer more choices for today’s machine designers and users. Heat or thermal loads are developed in clutches and brakes during dynamic engagement. The diagram below illustrates a typical machine cycle and identifies the portions of the cycle when heat is developed at the friction surfaces, or working surfaces of the clutch and brake. Often open housing for cooling allow friction material dust to escape. Many including vertical, horizontal, c-face, piggyback, and long coupled.